Joyce George was born as the eldest of the seven children of George and Mary, Paliyathu House at Vazhathopu, Idukki. After doing his schooling from Government High School, Vazhathopu, Joyce studied at Newman College, Thodupuzha and KE College, Kottayam at his pre degree and graduation level. While during his studies at Newman College Thodupuzha, Joyce had shown his interest in politics while powered him to become the Union Chairman. His interest in social activities further made him to join the Loyola College, Thiruvananthapuram for Masters in Social Work (MSW). Being a bright student, Joice George succeeded in securing fourth rank in the subject. After completing his bachelor's degree in Law from Government Law College, Thiruvananthapuram, Joyce became an advocate in the Kerala High Court. Popularly known as the legal advisor of High Range Samrakshana Samiti (HRSS), Joyce stood in front to protect the rights of the people of Idukki. The Highrange samrakshana Samity led by the Syro-Malabar Catholic Church, has been in the lead protesting against the implementation of the Gadgil Report and the Kasturirangan Report. An important suggestion of the Gadgil report is the emphasis on the empowerment of grama sabhas for deciding development projects in ecologically sensitive areas. But the Kasturirangan Committee provides no scope for the involvement of people in the decision making. Many wish to get the Gadgil report implemented as it is based on a more scientific approach after having discussions with the people. Joyce who is having complete support from the public would give a real fight in the 2014 Lok Sabha election. Joyce George is well supported by his family including his wife Anupa who is a plus-II teacher at St Jeromes Higher Secondary School, Vellayamkudi. 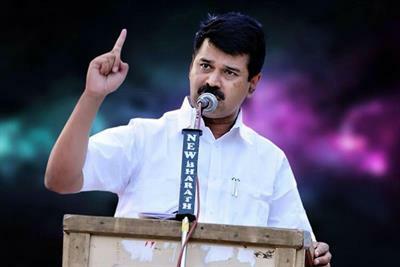 In 2014, Joyce George has been selected as the Independent candidate of the Left Democratic Front to contest from Idukki giving a tough competition to his arch rivals who represent the UDF, BJP and AAP. Joyce is one among the five independent candidates fielded by the CPI(M) for the upcoming Lok Sabha election. He was later elected as the MP from Idukki.